Classically Liberal: Prof. Mike Hulme on the politics of climate claims. Prof. Mike Hulme on the politics of climate claims. Prof. Mike Hulme is one of the most well-known of the warming doomsayers. He teaches at the University of East Anglia, in the UK. He is also surprisingly candid. (He is NOT the person in the photo to the far left, although he is on the Left.) Recently Hulme participated in a debate on the warming issue. The topic was along the lines: Do science and economics support government action on climate change? Hulme opened the debate, and the first thing he did was dismiss the debate topic itself. I took very precise notes of his words. Since I watched this on video, I stopped the presentation every couple of seconds so I could write down, word-for-word, precisely what he said. Hulme said: "Yes, I believe in government action on climate change, not action that is driven and determined by either science or economics, but action that is decided on of political ideology, risk evaluation, ethical judgments, public deliberation and a democratic sensibility." Hulme said that we should be clear that "neither science nor economics should determine government action. ...I make this claim about neither science nor economics driving government action because I believe it should be determined by politics. Politics which is, if you like, the conduct of social relations involving authority and power in order to make decisions. Politics is what we have. And that is where government action and policy should be formulated." Hulme was also quite happy to say what political ideology he uses. He said that the debate needs to start out with a discussion of the role of government. As he put it: "Is our preference for a small and minimalist state? Or is it for a large and interventionist state?" He said: "My own personal instincts, and my own political beliefs are for a more interventionist state, than for a minimalist one. So, for example, I believe in a state that would play a significant role with regards to wealth redistribution both within and between societies." An interesting confession I think. He wants a state that redistributes wealth "within and between societies." Now, unless Hulme means something unusual by "societies" he is speaking about international wealth redistribution. Ask yourself what kind of state is necessary to redistribute wealth between different nations. Is he speaking about global governance where the UN or some similar body has the ability to confiscate wealth in productive nations and redistribute it to unproductive nations? He's wasn't entirely clear on that but I note that numerous warming groups have pushed for international control of markets to "stop the warming crisis." This raises some interesting questions. Are the claims about warming the prime issues for these activists or are they secondary issues? Are the prime issues those of global governance, economic central planning and wealth redistribution instead? Hulme didn't seem to be saying that his politics is the result of his science, but that instead, his science is heavily influenced, perhaps solely influenced, by his politics. Is this debate primarily politics disguised as science? That certainly has been my view since the Green Left discovered warming claims to push a very precise political agenda. I previously argued that much of the Green agenda was created after the collapse of socialism around the world. Old socialist arguments no longer had any credibility and thus the centralized state with economic planning needed a new veneer to cover up the cracks and worn parts. 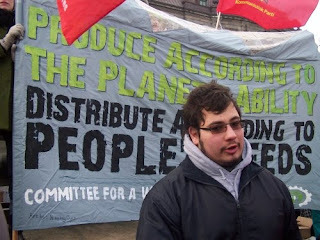 It is my belief that the many of the most ideological types on the extreme Left flung themselves into the environmental movement precisely because they it as a vehicle to relabel their ideology and give it the cloak of science once again. In a column that Hulme wrote he said: "Too often, when we think we are arguing over scientific evidence for climate change, we are in fact disagreeing about our different political preferences, ethical principles and values systems." Hulme says that the field of science has become a debate platform, not about science, but about politics and that we "fail to engage in honest and robust argument about our competing political visions and ethical values." He says science is too uncertain and incomplete and that is "especially the case with the science of climate, a complex system of enormous scale." Hulme says he thought climategate was good since it might push the real debate into the spotlight and the real debate is "about political beliefs and ethical values." Some years ago I wrote a political column that was published weekly. Typically they paired the column with one written by a woman I knew. She was a hard-core socialist and, a recent search online about her, reveals that she is still a socialist. She is an activist with the Democratic Socialists of America and says her goal, as well as the DSA's goal, is "to establish socialism as a political force in the U.S. and around the world by training mobilizing socialist activists...." After the collapse of socialism she became director of the Global Warming Project for the non-scientific Union of Concerned Scientists (membership does not require scientific credentials at all, just cash). That Hulme is openly saying that the global warming debate is not a scientific one, but a political one, is refreshing. Such honesty is rare with his compatriots in the warming trenches, even if their private emails showed them acting precisely like political lobbyists and not like scientists. But I suspect Hulme won't attract much of a following from his fellow warmologists. The reason is simple. They realize that if they presented their campaign in openly stark political terms, they would lose the debate. The public is not quite willing to march toward massive state interventionism is the name of of politics. And since the public isn't willing to march in that direction they need to be stampeded instead. And the way to do that is to try to scare the hell out of them using scientific theories. While Hulme is honest, his fellow warmologists are tactically smarter. They know that when it comes to politics, honesty is not the best policy. So they will continue to pretend, in public at least, that they are dispassionate scientists without a political agenda who are merely urging policies that are necessary due to the massive crisis that they say we are facing. And, if some silly blogger, writer, reporter, whoever, points to the political agenda they will act offended and howl in derision. Politically that is actually their best option. posted by blog owner at 1/30/2010 08:25:00 PM DiggIt! Reddit Del.icio.us Slashdot It! Finnish TV show looks at Climategate. Another IPCC scandal is fully exposed.